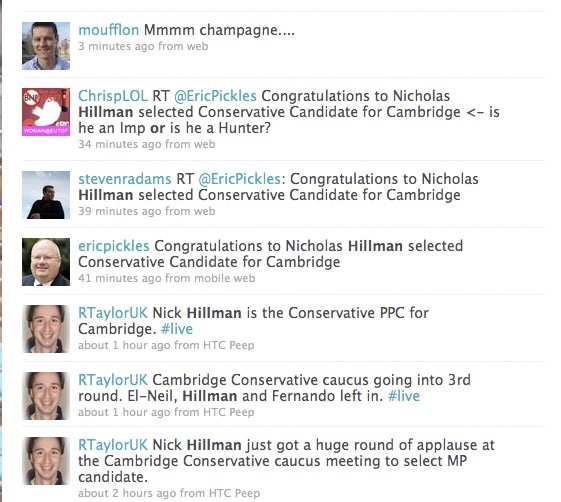 On the morning of the 12th of December 2009 I attended the Cambridge Conservative “caucus” which selected Nick Hillman as the Prospective Conservative Party Candidate for Cambridge in the next general election. The meeting was open to any resident of Cambridge who had registered to attend. Six candidates had been short-listed for the position and were presented to the meeting. There were multiple rounds of voting with candidates being eliminated at each stage. Mr Hillman obtained the necessary majority of votes in the third round. Around 50 people were present throughout the session and so eligible to vote. The meeting started just after 0930 and the result was announced at around 1400; it appeared that members of the public were being allowed to come in and listen later even if they had not registered. It would have been excellent if this opportunity had been advertised as it would have given more people an opportunity to hear from Mr Hillman. Mr Hillman confirmed that his main association with the city is that he trained as a teacher here, doing some of his training in Hills Road College. He cited holding his wedding reception here as a demonstration of his deep affection for the city. Supports waiting for the outcome of the Browne review on top-up fees. Supports a limit on immigration from outside the EU. Has committed to move to Cambridge before January the 1st. Mr Hillman said that there were certain groups which are currently hard done by such as part-time and mature students. He said we need to give help to a wider range of people to allow them to enter higher education. He spoke of a trade off between the tuition fee level and quality and appeared to be justifying an increase in fees for Cambridge students by saying that we have to do what’s necessary to keep Cambridge as a world class institution. He expressed his support for a system which would see different arrangements at different universities. He also pointed out that university funding is not all about fees, but about research funding too and pointed out that Cambridge has not done well out of the current government policy to spread research funding out very thinly across a large number of institutions. An amusingly stereotypical Cambridge professor (? ), who introduced himself as a fellow of Trinity College, complained that Mr Hillman had not made his position on tuition fees clear. He said that Mr Hillman had been asked for his view, but had not replied, and as an Mr Hillman was claiming to be an expert on university funding he expected him to have an opinion which he could share. This prompted Mr Hillman to expand a little, but still inconclusively. He said that universities have yet to make a case to remove the tuition fee cap and that it is not yet clear if the experience of students has got qualitatively better as a result of introducing fees. Mr Hillman was asked by the moderator what his view would be if tuition fees reached £7K/year; he responded to say that for students at Cambridge: “they would get good value in return”. A trainee Minister who introduced himself as “Peter” asked Mr Hillman about home schooling. He said there was a high percentage of home schooled children in Cambridge. He asked what Mr Hillman’s views were on the recent government clamp-down on home schooling which has seen government inspectors acting in a heavy handed manner, including by interviewing children without their parents present. Mr Hillman said he would defend the right to home school. Mr Hillman complained the recent pre-budget report had increased benefits but had contained no explanation of how that increase was to be funded. When asked if he would have voted for the war on Iraq, he said that given what we now know, he would not have done, but was unable to say what he would have done at the time. On Afghanistan he said we need to redouble our efforts there; and if we pulled out now the threats would remain. Mr Hillman identified this as a major issue for the city. He pointed to the three year waiting list for secure cycle parking spaces at the station as as an element of cycle infrastructure which is not good enough. He also reported a discussion he had had with the local police, who had told him Cambridge residents too often bought £200 bikes and secured them with £15 locks. He said he thought the suggestion he’d heard from the police of spending £150 on a bike and £60 on a lock was a good one, and proposed an education drive to get this message across to Cambridge residents. Following the announcement of Mr Hillman as the candidate a Conservative constituency Pauline Perry, Baroness Perry of Southwark, invited Conservative association members to a champagne, cakes (and mince pies?) fundraising event. At the beginning of his acceptance speech Mr Hillman referred to the event and made a plea for “as many funds as possible” to enable him to canvass every house in the City. Conservatives are reportedly now drinking champagne which has been chilling in Cllr Chris Howell’s garage. Cllr Howell, who is the city’s only currently elected Conservative, had come out in support for Mr Hillman, before the caucus meeting. I identified Mr Hillman as the leading candidate last week. I think it was telling that no-one asked Mr Hillman if he had ministerial ambitions if a Conservative government was formed following the next general election; I think that says a lot about his calibre as a candidate. It has been reported that around sixty people put their names forward and it has not been made clear how the six person shortlist was arrived at. A number of those voting said they were seeking to see anyone other than Sarah El-Neil, the local association chair, selected. El-Neil’s role in ousting the previous PPC, Richard Normington, is still not clear; and there has been comment that her entry onto the shortlist followed an unusually fast-tracked approval process by Conservative Headquarters. When El-Neil spoke about her hard work co-ordinating and directing the Conservative’s campaigning in the City there were loud murmurs, and coughs, of incredulity from Conservative party members. Michael White of the Guardian who was moderating the event noted that Conservative HQ had done a good job in shortlisting a blind man, two ethnic minorities and three women. It isn’t at all clear the shortlisting was done on the basis of merit alone. Some suggested that the shortlist was intended to give no real alternative choice to El-Neil. Before the meting started Mr White said he had first been told that the Cambridge Event was an “open primary”. He said that what was happening could not be described using those words. He said that the Totnes Open Primary was a real open primary with a 25% turnout (he contrasted that figure with the number of people in the room); he said that the Totnes event had cost the Conservatives £38,000 and for that reason was unlikely to ever be repeated. He suggested the phrase “Open Caucus” as a better description. Nick Hillman answering questions at the Cambridge Conservative ‘open caucus’ on the 12th of December 2009. While I think Mr Hillman was by far the best candidate out of those on offer at the meeting; I think Cambridge could do better. Mr Hillman clearly has a lot to do in understanding and forming an opinion on major issues such as the development and expansion of the city. I don’t believe he will be able to get elected, in Cambridge, with a policy of seeking to charge students in Cambridge higher fees than would be charged at other universities. I like what Mr Hillman said about working to get a fairer share of national resources for the city (a stance directly at odds with that taken by Green, Tony Juniper), but I felt Mr Hillman failed to even, briefly, explain how he would make the argument for investment in Cambridge. Clearly there was a lot which Mr Hillman was not able to present to the meeting; for example he didn’t mention his work in Africa, which others are praising him for elsewhere on the web. Residents of Cambridge have a lot to learn about Mr Hillman between now and when we’ll have to make a decision of who to vote for. This entry was tagged Cambridge, Election, Hillman on December 12, 2009 by Richard Taylor. @moufflon is Cambridge City Conservative Councillor Chris Howell. Congratulations to Nicholas Hillman; I think you and he can make a real go of this. I think you’ve highlighted a disturbing issue – the skewing effect of Cambridge uni students, meny of whom are at an age and part of their lives where they are easy fodder for sinister forces, on the electoral process. I agree that Hillman was probably the best qualified candidate of the options, although I am still confused about what exactly he stands for. The material on his website refers to his work on pensions and social equality, and his liberal position on immigration, none of which (strangely) he seems to have mentioned when positioning himself for Cambridge. Nevertheless, it seems a pity that they end up with the only white, male, fully abled candidate after all that trouble picking a diverse shortlist. Apropos David Vincent’s comment. I think the point is they picked the most “fully able candidate” – in every sense. The other candidates had some good qualities but overall the people of Cambridge (remember this was an open selection) picked the by far the outstanding choice. Some of the other candidates (particularly Mark Higgins, who came across very well and happens to be blind) would be excellent candidates for seats where they have greater local connection. I think Cambridge would have been poorly served by some kind of ill conceived positive discrimination. I did not expect my question on home schooling to get reported in the blogosphere – but that is fine! The open primary is a great way to encourage us local residents to feel we can be a part of the political process, I appreciated being able to ask questions. 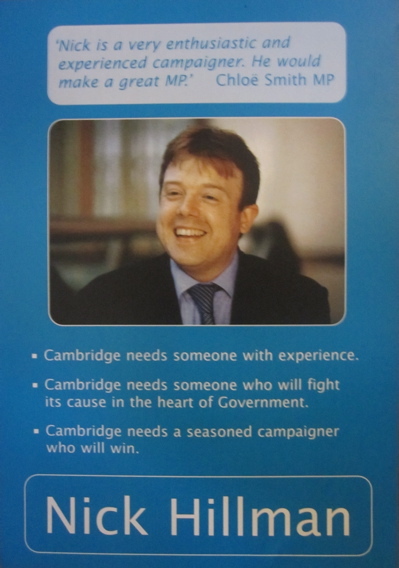 I think the candidate has the qualities necessary to win Cambridge back to the Conservatives. In response to “rn”, the shortlist had been praised elsewhere on the net for its “diversity”, so was itself perhaps the result of “some kind of ill conceived positive discrimination”. Of course. this turns out to have been little more than window dressing (although I see the two black women ran Hillman closest). As I said, on paper – and it appears in person – Hillman was far and away the strongest candidate. My point had more to do with the closed selection of the shortlist (might the people of Cambridge have preferred some of the other 54 (?) prospective candidates?). It does seems hard to believe there were no stronger candidates on that list with real local connections to the City. As regards, Nick Hillman’s work in Africa, he has said, “I spent the year after my teacher training doing a variety of jobs, including participating in a Raleigh International project in Guyana, working in a jeweller’s shop, taking part in a voluntary programme in Lagos and doing some supply teaching at home”. I don’t know if he has done further work there since, of course. Well, it’ll be an interesting contest. Nick Hillman offered to buy me, the “enemy”, a coffee and when I gave my phone number to contact me, there was silence. Perhaps it was something to do with his Conservatism piece on his blog, on which I commented to him that his reason for being a Tory seemed to be “I’m not a Socialist, and that was the only other choice”. I’ve since tried finding the Tory equivalent of the LibDem constitution (http://www.libdems.org.uk/constitution.aspx), and couldn’t. I’m sorry that an old friend has such thin reasons behind what is clearly a significant part of his life. to David Vincent in response to 3 above: the choice is not a surprise-the room was intentionally packed by a dissident group of white young men – mostly single, who were set on influencing the outcome. Their disruptive behaviour during the proceedings while the other speakers were addressing the audience was outrageous.Unfortunately,they dont have normal pressures on their time and can spend a whole pre-christmas saturday morning in a closed hall without inconveniencing family life or christmas shopping. I confess the whole process did seem open to manipulation, particularly given the small number of people who actually turned up. But I’m not sure who these white young men were “dissident” from, nor how it could be discerned that they were single (apart from their apparent freedom from Christmas shopping). If Hillman took the trouble to pack the room with his supporters, this at least demonstrates (a) a certain basic political nous and (b) the fact that he has some supporters who live in Cambridge. But is “young men” a euphemism for “students”? I see he was described on the CUCA site as “lovely”. Does this hark back to Frugal Dougal’s strange fear that students are “easy fodder for sinister forces” and that we should beware of the way they may vote? In response to David Vincent, and as Nick’s longstanding friend, I can confirm that Nick’s commitment to charity work in Africa extends well beyond the year after he graduated. Last year he took part in a trek in Ethiopia to raise funds for street children and earlier this year he raised money for Transaid (which provides transport skills such as driver training) by cycling in Zambia. I first met Nick in 1990 and we went to Bucharest to teach English together in 1992. There is no doubt that his track-record of charitable work is the result of genuine compassion sustained throughout his life. In my opinion, this is one of many qualities which will make him a truly excellent MP. Thank you for all the interest shown in my selection yesterday on this site, and thank you Richard for covering the selection on Twitter and Youtube as well as here. Public meetings have to engage the public and no one has done than you to help encourage that than you. Your comments about local knowledge are well meant and well taken. I am pleased my selection has generated such interest. It might be helpful to clarify a couple of points in the string above. 1. The Government has recently established a student finance review, which is supported by both major parties, which is headed by a non-party figure and which is committed to listening to students. Given that the party of which I am a member has been calling for just such a review for over two years (and indeed thinks it is a shame it did not begin two years ago), it would be odd to ignore or pre-empt the review just as it is starting its work. That is a view I share. We all want what is best for English higher education and students and a review by the experts will clearly help. Cambridge University says that it loses money on home/EU undergraduate places. I would like to see the really detailed figures on that which, as I understand it, are not fully in the public domain, but it is clear that a tutorial teaching style costs more to deliver than other forms of higher education. Clearly, it is a great way to learn and cannot be put at risk but we do students no favours if the student finance debate descends simply to an argument about the level of the tuition fees cap for full-time home/EU undergraduate students while ignoring other questions. Just consider, for example, all the other sources of university funding, such as research income, tie-ups with employers, university spin-off companies and alumni giving that exist, especially in Cambridge. Moreover, a quick and simple decision to alter the fees cap for full-time students would ignore (a) the costs to the Exchequer of the higher loans to pay the higher fees at a time of severe fiscal crisis and (b) the need to make part-time learners and mature learners a higher priority – here in Cambridge, the current £100 million cut in funding for ELQ (Equivalent and Lower Qualification) students is having a devastating effect on Madingley Hall which I deplore. So, on balance, given the importance and complexity of this issue, I think Lord Browne’s review is the right way to go for Cambridge and the right way to go for the country. 2. Not sure it is particularly appealing to wear one’s heart on one’s sleeve but, as it has come up, the blurb above about Guyana (in South America) and Lagos etc is correct. However, it is quite old and I have no idea precisely where it has been cut-and-pasted from. For the avoidance of doubt, since 2007, I have visited Ethiopia (where I was fundraising for Retrak, a fabulous charity dealing with streetchildren in Ethiopia, Kenya and Uganda), Rwanda (where I was teaching English to primary school teachers alongside other Conservatives) and Zambia (where I completed a 400-mile bike ride for Transaid, an excellent transport charity which, for example, builds and distributes bicycle ambulances). Africa is a wonderful, diverse and often troubled continent which I love. So, if you can’t bring yourself to donate to my campaign for Cambridge or are of a different political persuasion to me, please do give to Retrak or Transaid. They are both in real need of support. 3. I welcome CUCA’s support for me, expressed since the meeting yesterday. However, I don’t think it made any difference to the vote as it is currently the university holidays and the majority of CUCA members are not in Cambridge. After the event, I only met one person who I am certain was a CUCA member and I had never met him before. (Lib Dem Councillor) Neale: I am absolutely up for meeting for a coffee. You responded to my initial invitation, aided by a close mutual friend, with two highly political Facebook messages criticising the Tories, when I was really just after a friendly chat. Your emails rather suggested I had ulterior motives so I decided to wait until after the selection meeting before getting back in touch. But now that we are, how about a coffee in Clowns for old time’s sake very soon, perhaps even with J? On that occasion, I will be happy to leave the politics at home. Now I am off to continuing celebrating. Thanks again and I hope to meet those of you who I do not already know in due course. Thanks to Nick for commenting on some of the points made here. As for Jane Frank’s comments about a disruptive group of young white men influencing the outcome; that simply did not happen. Typical members of the Conservative Association might think that people like Councillor Chris Howell (38) and me (29) are “young” but I don’t think we would be seen as particularly young by those with other perspectives. I’d estimate there were only about six men under 40 present and voting; others being the individual who comments as “rn” on this site, trainee minister Peter Sanlon, Conservative activist Andrew Bower and the an ex-member of CUSU staff who asked a question of the candidate from Dorset about tuition fees . Six out of fifty doesn’t count as packing out the meeting; and the individuals are from a range of backgrounds and certainly don’t comprise a co-ordinated group. I would estimate that the male / female split among the under 40s was approximately 50:50 though the presence of Catherine Normington (aged 5 days) would have significantly reduced the mean age of that group! There is a section of the YouTube video which shows some of those present. I will see if I have a photograph which gives a clearer impression which I can post later. I thought there may have been one or two students (but you can’t tell by looking!) my impression was that students were if anything underrepresented at the meeting. The moderator commented that the meeting had been incredibly well behaved. There was almost no heckling, or any disruptive behaviour at all. Even when asking the “Cameron Cutie” who only recently switched allegiance from the Lib Dems if she now really believed in Conservative values, or when asking the candidate who had been campaigning for Shaftsbury, Dorset, just a few days before if she was in the wrong town, the tone was very calm and non-confrontational. The only point at which some of those present were unable to listen in respectful silence was when Sarah El-Neil spoke about her hard work co-ordinating the Conservative campaigning which goes on in the City. Some appeared to disagree with the way in which she presented what she had been doing and made that clear through murmuring and coughing. One thing I didn’t note in the article was that when the Conservative Association members voted to confirm Nick Hillman as the candidate there was only one vote against. 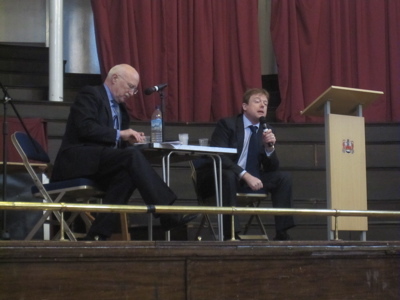 In reply to Liberal Democrat Cllr Neale Upstone asking about the Conservative “Constitution” – one of the first things David Cameron did after his election was run a quite impressive and inclusive process within the Conservative party which was aimed at agreeing the core aims and values of the party. There was a process in which all party members were able to participate which resulted in the formulation of the document. There was a national series of events allowing debate with shadow ministers (one event was held just outside Cambridge). At the time this was published I think each point was expanded further. Since 2006 though the Conservative party has changed a lot. David Cameron didn’t continue the initial level of engagement with party members and the party is now run very centrally – as we have seen in the short listing of candidates here in Cambridge. For a short period David Cameron engaged reasonably well, and directly, online however his “Webcameron” site was deleted a couple of years ago along with all the comments and discussions which were on it. (These included a regular Q&A with David Cameron which elucidated early policy statements which he was avoiding making elsewhere). If political parties selected candidates locally and allowed their members to influence party policy then their existence would strengthen democracy. In their current form I think the parties are detracting from the potential of our democracy. The three main parties have become disconnected from their membership and membership itself has plummeted to a point where only about 1% of the electorate are now members of parties. Does anyone have a record of what the actual numbers of votes cast in the various rounds of voting were? Just for info, the quotation at 7 above came from an article Nick Hillman wrote for the Times Educational Supplement in 2005. (The main thrust of that article was to warn prospective new teachers of the remarkable stresses involved in that profession and the need to choose their first schools very carefully). I am pleased to hear his interest in Africa has continued and expanded and I think it is helpful to have the details he and his friend have provided. The detailed counts at each stage were not announced. The voting was run by the Conservative party centrally; not by the local association. (The senior election agent for the East of England conducted the process) I suspect only the Conservatives centrally know the details. Congratulations to Nick, I look forward to working him to secure the right result for Cambridge in 2010.